A GP surgery that serves 6,000 patients is to close claiming the business is “no longer financially viable” because of pressure on services. The surgery which has been running since 1982 is shutting following a “decline in patient size list” and “a fall in NHS income”. Number 18 Surgery in Bath, Somerset has issued a letter to its patients this week announcing the closure because of “recruitment issues and financial pressures”. It says: “We are writing to let you know that we, the GP partners at Number 18 Surgery, have taken the difficult decision to close the practice this coming October due to recruitment issues and financial pressures. “Across the country, GP services are under pressure because of rising demand for services and difficulties recruiting GPs. “Number 18 has seen a decline in patient list size and a fall in NHS income, but a significant increase in demand on its services. It goes on to assure patients that the surgery will continue to provide a full service up until the end of September. The partners then hope that Number 18 patients and staff will transfer to the newly-formed Heart of Bath Partnership, which will see it merge with Oldfield and St James’s surgeries. “This will ensure that you continue to receive convenient, high-quality services, provided by current Number 18 staff,” the letter reads. Number 18 patients have been offered a choice as to whether they want to be seen at the Oldfield Surgery site, or the St James’s site, depending on convenience. The letter continues: “While we know the news of this closure is disappointing, we are excited about the opportunity to work with the Heart of Bath partnership. “It means our current practice team will still be able to see patients in a location very close to Number 18. “Our patients will also benefit from greater access to GPs, nurses and other primary care services. Number 18 Surgery has announced two ‘drop-in’ days to be held at their current site, in order for patients to ask questions and give feedback about the plans. These will take place next Wednesday, February 14, with sessions at 3-5pm and 6-7pm, and on Wednesday, February 28, with sessions at 3-4pm, and 6-7pm. The sessions will be held on a first-come, first-served basis, with no formal agenda. Patients who cannot attend have been told they can post a letter to the surgery’s address, or hand a letter to the practice reception staff. GP partner at Number 18, Doctor Charles Berrisford, said: “We are very sad to announce the closure of Number 18. “The practice has had a long history and has established a great relationship with both patients and people who have worked with us. 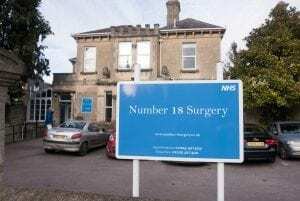 GV of Number 18 Surgery (NHS) at Upper Oldfield Road, Bath. “After a number of retirements, we have been unable to recruit new GP partners and our NHS income has reduced because of our relatively small patient list size. “We’ve explored whether we can secure investment in the business but unfortunately the premises are not big enough. “We are committed to supporting our patients throughout this period of change and are very excited about the opportunity to work with the Heart of Bath partnership. Dr Arun Gadhok, GP partner at St James’s Surgery, added: “Patients of Oldfield Surgery and St James’s won’t see any difference to services in April. “They will still contact their practice in the same way and continue to see the same GPs and other staff in the same location. And Corinne Edwards, Director of Acute and Primary Care Commissioning at Bath and North East Somerset Clinical Commissioning Group said: “The merger will bring many benefits to patients. “The Heart of Bath partnership will provide opportunities for even better access to GPs, nurses and other primary care services in years to come. “It will also make it easier for staff to share examples of best practice to further drive up standards of care. Full details of the merger and closure of Number 18 are expected to be published on the websites of all three surgeries, as well as in letters to patients, by tomorrow (Fri). But patients of Number 18 Surgery in Upper Oldfield Park in Bath, Som., have been reassured they will not need to register elsewhere. A letter revealed that the surgery is in talks with two other nearby surgeries to merge and become the Heart of Bath Partnership – and that its patients will then be transferred.